The Chandler DNA Project has four participants with roots in Barbados. Three live in Australia, though one was born in Barbados in 1948 and migrated there. The fourth lives in Barbados, having recently moved there from Trinidad to work. One of the Australian participants has not yet shared his lineage with us. Barbados is the most eastern of the Caribbean islands, and therefore the one likely to be encountered first by travellers from Europe. However, the first indigenous Barbadians were Amerindians who made the dangerous crossing from northern Venezuela, South America, to the nearest Caribbean island of Trinidad in dugout canoes. This may have been as early as 1623 B.C., as recent archaeological finds include artifacts dating from that time. These short, olive-skinned Arawaks were agricultural people and fishermen. In the year 1200, the Arawaks were conquered by the taller and stronger Amerindian Caribs, aggressive, skilled bowmen who used poisoned arrows and also engaged in cannibalism. 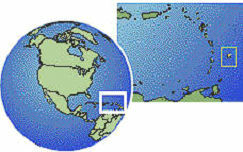 In the 15th century the Portugese came from Europe to Barbados en route to Brazil. A Portuguese explorer named the island Los Barbados (the bearded-ones), probably after the local fig trees, which have a beard-like appearance. At the end of the 15th century the Spanish took over the island, bringing slavery, small pox, tuberculosis and ultimately extinction to the Caribs, before moving on to the larger Caribbean islands. This left the island open for colonization. The first English ship landed on 14 May 1625 and Captain John Powell claimed the island on behalf of King James I. The first settlement was named Jamestown, later renamed Holetown. People with good financial standing and social connections in England were allocated land. Within a few years much of the island had been deforested to make way for tobacco, cotton and indigo plantations. Nicholas Chandler and Robert Chandler were two of the 764 names of people holding more than 10 acres in Barbados in 1638. There are records of the descendants of Robert Chandler until 1706, but after that date no records of his family can be found. In a deed dated March 1639 Nicholas sold a plantation of 60 acres in the parish of Christ Church, together with livestock and domestic items, for 30,000 pounds of cotton and tobacco. Subsequently he lived in the parish of St. Michael and was shown as “Nicho. Chandler”, owning 5 acres of land, with no servants or slaves, in the 1679 census. He died the following year and was buried in St. Michael on 3 July 1680, purportedly at the age of 102 (in which case he would have been born in 1578). Apparently his son Nicholas Chandler did not enjoy such longevity: the burial of Nicholas Chandler Jr. was recorded ten years earlier, in June 1670. 2 July 1659 Giles Chandler of London, a brazier, was bound to John Walter of Bristol, to serve four years in Barbados. 28 April 1662 John Chandler was bound to Robert Eilsey to serve four years in Barbados, traveling on the vessel Charles. 21 November 1665 Susanna Chandler was bound to Tobias Pindar, to serve six years in St. Christopher. It is probable that the descendants of Nicholas Chandler Jr. moved to the north of the island: in 1709 another Nicholas Chandler was selling Christopher Chandler 5 acres in St. Lucy, and in 1732 the will of a Dowding Thornhill mentions “13 acres of land whereon Nicholas Chandler now lives”. By the time Christopher Chandler made his will in 1727, he was living in St. Lucy on 21 acres of land, and had four sons and five daughters. His widow Elinor was still alive in 1743 when “for natural love and affection” and in consideration of a nominal sum of five shillings, she sold her son William 12 acres in St. Lucy. William’s father had bequeathed these 12 acres to William in his will, entered on 9 May 1729, but that inheritance was only to occur after the death of his widow Elinor, William’s mother. So this sale for a peppercorn sum was Elinor’s way of avoiding William having to wait for her death. This is probably because he had recently married Ann, with whom he would have a number of children, including William and John, the ancestors of two of the DNA project participants. One of those participants is John William Chandler who lives in the state of New South Wales, Australia, but was born in Barbados in 1948. John’s grandparents were Leonard and Deborah Chandler. Unfortunately no other Chandler wills or deeds are available until 1792, due to the ravages of time, hurricanes and the fact that the Rector of the parish of St. Lucy returned to England taking records with him, which were lost when the ship went down. One of Christopher’s other sons was Thomas, who would inherit 9 acres from his father’s estate on the death of Christopher’s widow. This Thomas may well have been the father of another Thomas, born in St. Lucy in 1740, who is believed to be an ancestor of the third DNA Project participant. The grandson of 1740 Thomas, another Christopher, married Elizabeth Rock in 1813 and had seven children with her. He was a planter and also taught in the parish school in St. Lucy. In 1836 Christopher had a child “outside” the marriage, named William Edward, with Rebecca Jordan, the daughter of a freed slave previously owned by Christopher’s mother Mary Jordan. (Slaves often took the surname of their owner.) Christopher died, probably during a cholera epidemic, and was buried in Speightstown (locally pronounced Spikestown) on 27 May 1854. He was said to be aged 64, but this does not equate with the 1792 marriage date of his parents. William Edward Chandler, the “outside” child, left Barbados for Australia soon after his father’s death. Follow this link to read more of William Edward’s story and his descendants. It is worth noting that the surname Chandler occurs quite frequently in Barbados. For example, Michael John Chandler, author of several reference books about Barbados, was Archivist at the University of the West Indies (UWI) for a number of years. Aria Chandler was on the Dean’s List of the UWI in 2009. Ann M. K. Chandler writes non-fiction on social affairs, e.g. schoolchildren’s nutrition. Samuel Jefferson Chandler became Permanent Secretary, Foreign Trade Division, Barbados Ministry of Foreign Affairs and Foreign Trade, in 1999. 1 Abbreviated History of Barbados, The Barbados Tourism Encyclopedia,http://www.barbados.org/history1.htm, last checked February 10, 2010. 2 About Barbados, Ministry of Foreign Affairs and Foreign Trade, http://www.foreign.gov.bb/general-information/history, last checked February 10, 2010. 3 Duke, William. Memoirs of the first settlement of the Island of Barbados (London: E. Owen and W. Meadows), 1741. 4 Hotten, John Camden. The Original Lists of Persons of Quality etc. (London), 1874. Reprinted Genealogical Publishing Co. Inc. 1986. 5 Research at Barbados Department of Archives, Black Rock, St James, Barbados. 6 Coldham, Peter Wilson. The Complete Book of Emigrants, 1607-1776 (Novato, CA: Broderbund Software) c1996. 9 Research at Barbados Department of Archives, Black Rock, St James, Barbados.